Synopsis: An insurance investigator begins discovering that the impact a horror writer’s books have on his fans is more than inspirational. My Quick Review: It feels so good to watch In The Mouth of Madness almost 20 years since I first watched it in theater. Back then I was a teenager and already a big fan of Horror Movies, and John Carpenter was the Man, the Master of Horror who had yet to make a bad movie (I’m not considering Memoirs of an invisible man to be a Carpenter’s movie). In the Mouth of Madness was fascinating to my younger self and I have to say it hasn’t lost much of its impact with me after a second viewing. This is indeed Carpenter at his best and while the film is a blatant homage to horror writers such as Stephen King and of course HP Lovecraft (whose work heavily influenced the creatures introduced in this film) it also fits well with 2 of his other monsters/apocalypse movies, The Thing and Prince of Darkness. Carpenter relies heavily on practical effects and makeup (highly appreciated in an age of everything digital) and succeeds in creeping us by giving us a feeling of uneasiness thanks to some truly nightmarish visuals (The old guy on a bicycle, the husband handcuffed to his wife ankle, the arm creeping outside Sam Neil’s asylum room, the painting…). 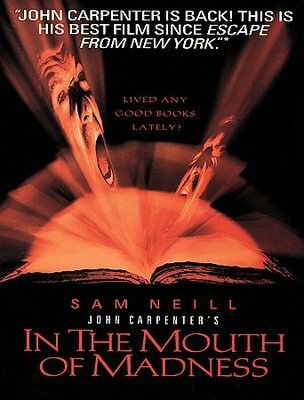 if you’re a fan of Carpenter or Lovecraft or just an old-school horror afficionado, you can’t afford to miss In the Mouth of Madness, one of the most underrated gem in John Carpenter’s career.